How toxic are traditional cleaning products? known to cause human health or environmental problems1. 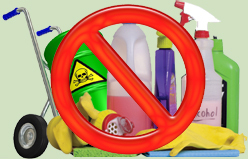 Todays cleaning products are formulated with a vast variety of chemicals, many of which are considered toxic. There are over 75,000 synthetic chemicals registered with the Environmental Protection Agency (EPA) and a large number of these chemicals are suspected carcinogens or are thought to cause a number of health problems. Less than 20% of the chemicals have been adequately tested for their effects on human health. Depending on the duration and extent of exposure to harmful chemicals, they can also cause reproductive disorders, major organ damage and permanent eye & skin damage. Go Green by using safer cleaners and avoid these risks. When these products are used, the chemicals they contain can stay suspended in the air for hours or even days after the product has been used and are easily and unknowingly inhaled. These chemicals also remain behind as residues on the surfaces and floors to which the cleaners have been applied. These chemical toxins are easily absorbed through contact with the skin. When chemicals from different cleaners come into contact with each other, they sometimes mix to form new toxic substances which magnify the potential health effects. Children are more at risk to toxic exposure from cleaning products than adults. More about the dangers of chemical cleaners and children. The environment also suffers from the toxins in traditional chemical cleaners. Environmental contamination occurs during the manufacturing, use and disposal of these toxic products. These chemicals are routinely washed down drains and sewers ultimately finding their way into lakes, rivers and streams. Once these chemicals enter surface waters they threaten our drinking water, plant and animal life and our ecosystem. 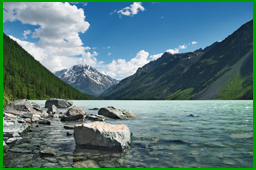 Using safer green cleaning products will protect our environment for future generations. Learn about the specific dangers of chemical cleaning products.